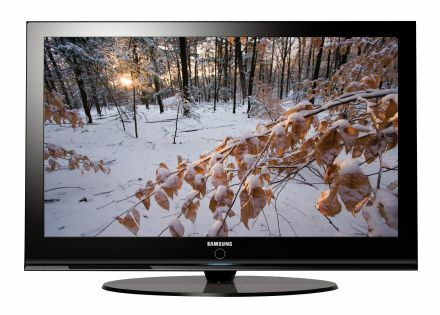 Samsung announced the Samsung HP-T5894W wireless TV at CES 2007 last week. The HP-T5894W (couldn’t they have thought of a better name?!) is an interesting combination of wireless media streamer and TV. Most media streamers wirelessly connect to your PC, and plug-in to your TV to deliver content already downloaded . In contrast, the Samsung HP-T5894W starts with the wireless connection at the TV, and wirelessly streams content from a media hub into which is plugged your TV connection. The main attraction of the HP-T5894W therefore, is that it does away with wires (except for the power cord, obviously), meaning you can hang its gloriously slim profile on a wall without a ball of spaghetti messing up the otherwise perfect profile. More details of the Samsung HP-T5894W wireless TV after the jump. The Samsung HP-T5894W effectively acts as a TV and media-streamer in one, but obviously differs from your ordinary media streamer by doing without the PC, accessing content from your existing TV connection (cable, satellite, etc.) instead. However, given that it supports 802.11n to wirelessly receive the content, there’s every chance it could actually receive content direct from your (wireless-enabled) PC, as long as the data being transmitted is pure HD signals. No confirmation of this yet, though. Less tasty is the price: $5799 – ouch! The Samsung HP-T5894W release date is September 2007.